2010 estimated disposable income range of $107-$124 billion. 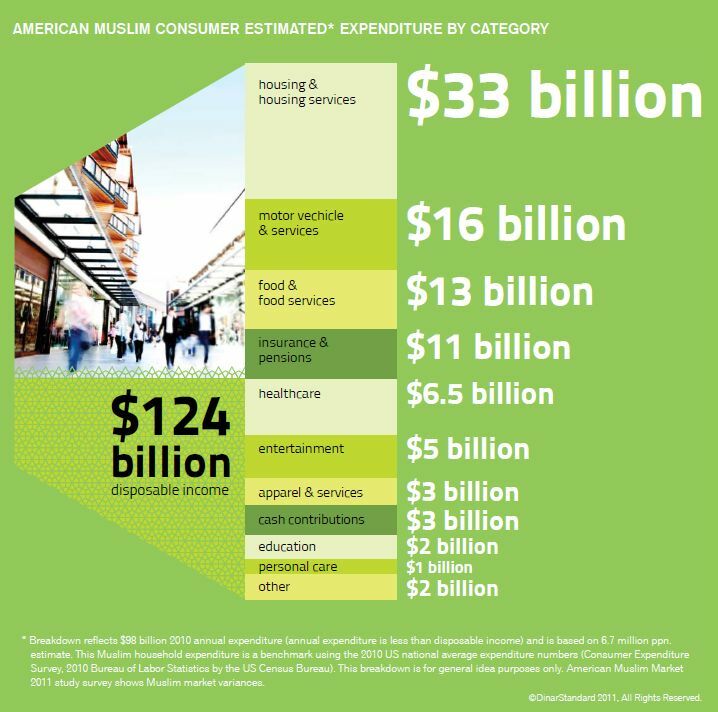 Demographically, American Muslim population is younger than the national average, and the education and income levels are at par with the average American household profile. For more, download the free Executive Summary (see right column) or purchase full study. Early Days: No doubt, this market presents a significant opportunity for businesses. While brands such as Walmart, Best Buy and Whole Foods are beginning to engage with this market in a targeted way, the potential is still mostly un-tapped. At the same-time, there are some unique challenges: the market is very diverse, has unique consumption nuances, carries for main-stream brands reputation concerns, and is geographically fragmented. 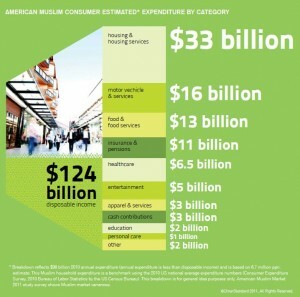 The Ultimate Guide – American Muslim Market 2011: Business Landscape & Consumer Needs Study is a first-of its kind grass-roots market landscape and consumer needs study. EVALUATE: Get the most consolidated view of the existing American Muslim market demographic and DinarStandard’s market sizing estimates. HEAR THE CONSUMER VOICE: Get the latest pulse of this fast-growing consumer market delivered through a credible national survey that includes ability to filter results by geography, major ethnic sub-clusters, and other demographics (includes responses on major halal food and Islamic finance brands). REACH: Get profiles on the different dynamics among major Muslim population Centers across the country as well as a prioritized list of major Muslim market influencers (media channels and organizations at national and State level). Download a free copy of the Study’s Executive Summary (see Form above). Also, see the Study Fact Sheet that includes: approach, table of content, consumer survey response rates per question. * Please Contact us to be invoiced for check payment or bank transfer. * Secure payment processing through PayPal including Debit or most major Credit Cards.